Can India afford universal pension for the elderly? New Delhi: NAC member Aruna Roy is leading the newly formed Pension Parishad to demand a universal pension scheme. 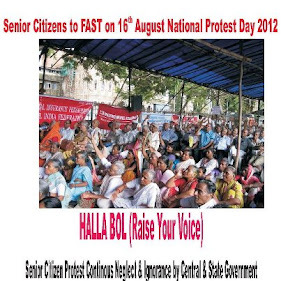 The question is whether every elderly person in India who is above 60 years of age should be entitled to a pension. The question was taken up by IBN18 Network Deputy Editor Sagarika Ghosh on her show Face the Nation. Sagarika Ghose: Hi! Should every elderly person in India who is above 60 years of age be entitled to a pension? That is the demand by a campaign led by the Pension Parishad currently staging a five-day protest in Delhi. Now India is an aging society with numbers of elderly rising very fast. Is it time senior citizens, many of whom are no longer living with families, are taken care of by the state? So a demand for universal pension for all above age of 60, the senior citizens who are a totally neglected group and should this change because as we said the numbers of elderly is rising very fast. Joining us tonight is Nikhil Dey activist, MKSS, Co-Convener NCPRI, Sri Ram Khanna, Managing Trustee, Consumer Voice, Gautam Bhardwaj, Director, Invest India Economic Foundation/MD, Invest India Micro Pension Services, Gurcharan Das, former CEO, Procter & Gamble India & author. We also have celebrity senior citizen on our show tonight. 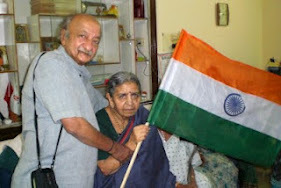 I spoke earlier to filmmaker Shyam Benegal and asked him why he supports this campaign. Shyam Benegal: The way the population on one level is aging and the other in the manner our society has changed over the years, you know older people now have less and less any kind of support system and this is happening in an alarming way all over the country. And I think Aruna Roy and her band of people are pinpointing on something which essentially is important because I think a lot of the older people are left with support because you know in our country it was always the children who looked after the parents but then the breaking up of the joint family and so on and then urban living, nuclear lifestyle, all those sort of things you know the toll is enormous on the older folks you know generally. So that's the reason I think because there has to be some kind of a safety net for older people in our country and that is missing at the moment. Sagarika Ghose: But is pension the only thing the elderly need at the moment or see a range of other measures are also needed? Shyam Benegal: Pension fund is one aspect of it, but there are so many other things; old age home now of course are absolutely necessary particularly you'll find that in urban India than anywhere else because see rural families still continue to... I mean there is still some kind of family support but in urban India the fact is there is no support at all and that is where the real problems are. Like, I can see in the city of Mumbai or for instance Pune, in places like these it far more serious than it ever was in the past and it is going to grow. Younger people are well reminded that they are not looking after their old would like to hide that fact but the fact is that this is a real problem and we have to face up to it. You know it is a social problem not just the problem of the government, it is a question of the society itself particularly the middle class of this country, you know the growing middle class of India needs to start looking it as a serious responsibility in terms of their familiar responsibility. Sagarika Ghose: Right, that was Shyam Benegal on why he supports this particular campaign of Aruna Roy and Pension Parishad. We have Nikhil Dey from the Pension Parishad, tell us you have seen Shyam Benegal's concerns we have the statistics of elderly, 88 million elderly in 2009, 315 million elderly we will have by 2050, it is a big myth to think that we are a young country, we are a rapidly aging country. In that context what are you aiming to do? Nikhil Dey: We are aiming to make sure that every Indian can live with dignity. To image that a citizen has worked for 40, 50 years of his life, contributed to the nation, contributed to the country and kept their body and soul body just on hard labour and when it comes to a stage when their bodies cannot support themselves, to say that they should be left alone and to die basically because that's what it amounts to is an absolute shame. To say that at a time when we are growing at the rate of six or seven or eight per cent is even worst. And to say that it costs too much money, does it costs too much money to feed yourself, does it cost too much money to provide basics and if we have large number of elderly than that is our main national concern. And I think it's very important that many group have come together, many who don't work on the issues of the elderly because we are seeing right across, we are seeing the numbers of people, it's quite right what you say it's not just pension but pension allows a variety of support system. You can't get water for yourself, you can't carry a matki, you can't go anywhere, you are not seen, heard, you can't live in a city like Delhi. There is no place for elderly to walk on the road, they'll be even crossing the road. So, somewhere we need to start understanding that as a nation what we are and what we need to provide for. And money, in fact countries poorer than India are providing universal pension schemes, you know Nepal is, South Africa is. We need to start thinking in a much more positive fashion. Sagarika Ghose: There is no possible disagreement with the moral argument there, there can be no moral disagreement with Nikhil's argument there at all Gautam Bhardwaj but I want to ask you on the economic survey. There is the issue of our fiscal deficit, there is the issue of entitlements economy is impoverishing our exchequer, we have right to food, we have right to education. We simply cannot afford all these kinds of welfare. We also have the Pension Fund Regulatory Authority Bill, the pension reform bill which the government is trying to push through in order to reduce it pension liability, therefore given these huge numbers of elderly that we do have, the simple question – can the government afford it? Gautam Bhardwaj: Well the simple answer is government, as things stand, can't afford it. But the larger question is that this elderly is not the static population as you very correctly said, where the numbers will continue to grow even if the Finance Minister was to pull out Rs 2-2.5 lakh crore and pay the bill this year. Can we be sure that the same amount will be available the next year and the year thereafter? If you are going to wake up suddenly let's say in 2030, the population that we are talking about is going to roughly 200 million people, not just 100 million people and the pension we'll be talking about at that stage will be Rs 10,000 per month not Rs 2,000 per month. So when you think of numbers like this I think the numbers become very staggering and I don't think these are sustainable numbers. I would think I can't fault Nikhil Dey on this question but I think it will need much more careful planning at the level of currently core and more importantly what we are seeing is the result of policy in action over the last 50 years. Sagarika Ghose: The states had abdicated its responsibility towards the elderly for years but let me get you to respond to that, the bill is just too high. Nikhil Dey: Ok if it is too high, what is reasonable? Rs 200 that is being given today and even that not been given to 80 per cent of those people. So, number one, can't we say that people don't have to go around clutching papers, taking photographs, running after to try and at least get that Rs 200. Then we can start saying, ok if not Rs 200, not Rs 2,000 then what is reasonable? What can we afford? Can we start that instead of saying that it's simply not affordable and can't do anything about it? And can we start understanding that there are huge people, there are human beings with lives, each one of them and they live amongst us and each one of us will reach that age and what gives dignity to us more affluent people is the fact that they have some degree of economic independence, something. So these are people with no other income. Sagarika Ghose: So the only issue is that does it have to be universal pension or can it be access to health care? Could that be one way of looking at it? But let me bring in Gurcharan Das. Gurcharan Das India does not have a universal social security system, the current pension scheme covers only the employees only in the organised sector that is 12 per cent, 80 million Indians are not covered by any pension scheme whatsoever. Surely this is the crying need. Gurcharan Das: Well surely it is a crying need and there are many crying needs in our society. You know the welfare state which this is a reflection of came into being after 200 years in the west of rapid economic growth and reaching an income level of $20,000 a year then those countries think about these sort of things and our income is $1500 a year, at least get to $5,000 a year. And you know the timing of this campaign is amazing because we are just been downgraded and the country is in serious financial crisis. Now, we are downgraded as a country and we are talking about this right now when we actually should be cutting back on the subsidies and you know it's not a moral issue. You are going to try to say oh he is not compassionate, I am compassionate, well know we are all either same in the world but let's be realistic and say what can we afford at this stage in our development? We are still a poor country, and a poor country cannot begin to behave like a rich country. So why give a pension of Rs 2,000, give a pension of a lakh of rupees that will give you more dignity. Sagarika Ghose: Let me extend your argument to Sri Ram Khanna. Should then the state be not burdened with these kind of payments? Should the responsibility with the senior citizen be much more with the society, be much more with family, be much more with stake holders, that should we be pushing forward? Sri Ram Khanna: See what our friend Gurcharan Das is saying is something of a senior citizen's cozy investments, monthly incomes coming from all over the place and he couldn't care less about that impoverish person who has nowhere to go, his family has abandoned him and he has no money for food, no money for shelter, no money for health care. You can't say wait on till India reaches $5,000 per capita income that'll be 20 years down the line and there are millions of people who need care today. So I am not saying you don't wait, you wait to put public money. But let me tell there are people in this country who have worked through their youth, never saved a penny and if they would have saved through out their lives they would have pension from their own money. Sagarika Ghose: Let me just put that to you, you know we are speaking consistently of pension but you know as Shyam Benegal said there are old age homes, service providers to the elderly, service sector to the elderly, security to the elderly, now if those issues are taken care of then surely old age homes, service providers can be done on public-private partnership. If you are worried about the costs would you be satisfied or only pension is going to satisfy you and other ancillary measures are not enough? Nikhil Dey: It's very interesting Sagarika actually we've been on the other side of the debate of cash transfers for a long time, pension is a cash transfer. Sagarika Ghose: This time you are actually arguing for cash transfers. Sagarika Ghose: Gurcharan Das you argued that cut subsidies, instead give cash transfer as Nikhil is saying this is a cash transfer. Gurcharan Das: I would say that now this is the time to cut subsidies like diesel, we have to cut subsidy on fertilizer and we have to make our nation affordable, you know first you must bake the bread before you begin to distribute it. Now, having said that let me say that I support RSBY, you Rashtriya Swasthya Bima Yojana which is an insurance for health, universal insurance for health. Nikhil Dey: It's not universal. It's just BPL. Sagarika Ghose: It's just BPL actually. Gurcharan Das: Ok, the point here is that not to quibble about but it is for the poor and the point here is that I support it because one, it is affordable and two, it is tangible and here in this particular case I would do it as a real exception. I would say we have to now think of a country which is going to grow and where people have to work not create bogus jobs as we create but real jobs. And that you get through growth, through hard work and not through entitlements. Nikhil Dey: The people we are talking about have worked all their lives without any single entitlement, without any single subsidy, on their own hard work and they have contributed to this nation's growth rate and it is a complete insult to them to say that they have depended on some of the larger to survive but now they can't work their bodies don't help them to work. So, at that point only we should say that it is a payback, it is a cost that we should have made sure that they had adequate amount left over for a pension for what a pension is. It is a part of your working life later extended to security. This is not an entitlement or a dole of a different kind. Sri Ram Khanna: This argument of pension insurance was actually used by the trade union movement in the 50s and the 60s. So you will find wherever labour was organised there was pension in the public sector, in the government employees unions, in the large companies they created a system for themselves and they forgot about the poor and everybody outside the system. Sri Ram Khanna: It is. Gautam Bhardwaj: We are speading 100,000 crore on pension. Sagarika Ghose: Are we saying that we cannot afford any welfare to the elderly at all? Sri Ram Khanna: You have to force everybody to put aside a part of their income every month into a pension fund. You have to force everybody. Nikhil Dey: Why can't we force a part of that growth which is the income of the country why can't we look at the structure we have huge numbers, we have a huge country, we have to produce a simple system and we are not asking for the earth. Actually Rs 2,000 is just half of minimum wages, let's start talking about what's affordable, let's universalise it, let's make sure that no one is left without any kind of security and some degree where we can start thinking about how we deal with the large number of people everywhere. And I invite Mr Gurcharan Das to come just for 5 minutes to that Dharna where people have come and just talk to them and explain to them how they will wait 20 years. Sagarika Ghose: How they will wait 20 years? Gurcharan Das: I would love to go. Sagarika Ghose: Let's put to Gautam Bhardwaj the question about the Pension Fund Regulatory and Development Authority Bill, the PFRDA Bill which is now pending in Parliament. Now can you tell us within the context of the demand for the universal pension how this bill will help? Will this bill partially help, will this bill not help at all, how will this bill fit in this context? Gautam Bhardwaj: I think the bill is an important bill, it will help at two level. One, it will enable and encourage people who are currently young and who can save for their old age, it will provide them a secure environment to achieve that. At the level of current demand which Nikhil and his team have I think the size of the population that is going to emerge, the next generation of the elderly some of them would have self provide for their old age and you'll find that instead of. Sagarika Ghose: Even in the unorganised sector? Gautam Bhardwaj: Yes, we are currently working with informal sector poor and we have half a million people who are putting aside Rs 1,000-2,000 a year. Sagarika Ghose: Who are working in the unorganised sector? Gautam Bhardwaj: Rickshaw walas, maids, vegetable vendors and others and these are about close to in 100 districts. This has started and PFRDA, the pension bill is trying to achieve that. It will not solve the problem for everybody, there are lifetime poor who can't save at all, there are dis-savers can't save, there are people already in their 50s who won't be able to accumulate enough money but it will still chip away at the problem so you won't end up with another 100 million elderly who are destitute in 2030, you probably will end up with 60 million or 70 million. Sagarika Ghose: Right, you don't find this solution workable? Nikhil Dey: No, no I am saying today people are even fighting for that Rs 300 which the government gives today. Today, the first battle is to universalise, after universalising we feel and it's not unreasonable Sagarika if you think about it how much a person will require to survive? Rs 2,000 is not at all an unreasonable amount but if government and many others say that it's not reasonable then let's start talking about what is reasonable. Sagarika Ghose: Rs 2,000 per person not per family? Sagarika Ghose: So, let's universalise it then start talking about the figure? Sri Ram Khanna: The starting point is that many state governments are already giving old age pensions, old age pension are being given in Delhi and a number of other states which he can tell you. But they are covering only a small number of people. Sri Ram Khanna: There are limitations to the budget, then only few selected people get it, they get it after bribing, they get it after running after the paper work, the things are already been done by the state governments which means governments are already allocating the money for this and it's not enough to cover everybody. Gautam Bhardwaj: But I think there is an issue there which is that states are giving different amounts, Haryana is giving 1,000, Delhi is giving 1,000. Sri Ram Khanna: The idea here is that if there is political intent in state governments then why can't we have a state policy about universalising this? And having a plan to implement it? Do it slowly, step-by-step. Sagarika Ghose: Gurcharan do you believe that there is no need to think for pension at all or should we move incrementally in small ways slowly towards the national pension policy? Gurcharan Das: No, of course it's a good idea but you know my only problem is that a nation must live within its means. If you read recent economic survey of India report, the World Bank report, the Standard and Poor's report which downgraded us, what they are all saying is that India is living beyond its means and I fear that we might have the kind of crisis that Brazil had in 1972 when it too began to live beyond its means and it went into...you had three decades, three lost decades for Brazil. Sagarika Ghose: So you believe that this is premature and extravagant welfarism? Sagarika Ghose: Wealth creations not entitlement. Let's create wealth and not give out entitlement. Nikhil Dey: Who can we afford? Can we afford the 5 lakh crore that we give in tax subsidy to the rich which is there written in our budget or can we afford what level of taxation in this country and the country Mr Gurcharan Das is talking about and in Brazil you have universal pension and you half a minimum wage. Sagarika Ghose: So you are saying that what GD is saying is not right? Nikhil Dey: Brazil has a fantastic safety net. Gurcharan Das: Yeah, but Brazil have $10,000 income and they can afford it. Nikhil Dey: Today, what can we afford? We can't afford $1400 which is their minimum wage. Can we have our elderly to die without the concern? Sagarika Ghose: We cannot afford extravagant and premature welfarism. Nikhil Dey is saying we cannot let our elderly die, this is a polarised debate.